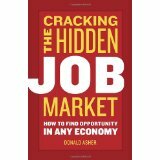 I like Don Asher’s style and practical approach to career coaching & advising. This book is filled with great advice on helping people realize that you “have to turn over a lot of rocks to find work” (that’s what I say all the time, see my blog on this). He says that all industries are hiring all the time due to death, firings, people moving, retirement, expansion, or whatever. I agree. When people say there are no jobs in our area, I say, “There are people getting hired in Waterville Maine where we live every day”. And its true. What Don does well is give specific, concrete steps for people to take in order to find those jobs BEFORE they get advertised. I was working with a young client recently and he wanted a new job so bad and spent hours and hours applying online to everything he could find. I told him he NEEDS to buy this book because his approach is all wrong. Computers do not hire people, people hire people. Get out there and talk to people and stop spending so many hours online. It is not your network that is best at getting you a job, but THEIR network. There are lots of opportunities in smaller companies, don’t get seduced by the big names. Have a focused approach to finding work, don’t say “I’ll take anything” because people can’t help you when you say that. You have to have 100 leads going on all the time, that way you don’t worry if one fails. This is a fairly quick read yet packed with great advice. I highly recommend this book to career practitioners and career seekers who are frustrated with the job finding process and need to use current methods of finding work. If you have not read my review on his book, How to Get Any Job With Any Major, check it out here.